Cultured pearl rings for women are true assets to every fashionable lady’s collection of jewelry. They represent strength and contribute to the unique style with their own story. Not so while back, pearl rings were often used for proposals as engagement rings. Today this is a less conventional accessory, but people who wear them emphasize their presence and sense of self for everyone who sees them. Continue reading and find out our tips on how to wear a pearl ring. Pearls may cost less than diamonds, but you will find a fascinating difference in price on rings with natural pearls. Some of them can be quite costly when in comparison to diamond rings because they are more difficult to set because of their sensitivity when compared to mineral gems or diamonds. Like with any other piece of jewelry, the particular price is determined for each piece and depends on many factors (gem quality, additional stones, design of the setting, value of metal etc.). The value of single a pearl piece was great even in ancient times. One example comes from times of Roman conquest when general Vitellius paid the military with a single pearl piece from his mothers’ earrings. The history of this beautiful trinket is rich and colorful. It was and always will be considered one of the most valuable jewels since the ancient times. One of the first legends and beliefs portrayed pears as tiny specs of the moon and believed it possessed magical powers. The oldest pearl jewelry piece known to historians dates back to around 520 B.C. This ancient gem was discovered in a sarcophagus of a Persian princess and can be seen today in the Louvre Museum in Paris, where it has been safely kept for over a century. This exquisite example is known as „the Susa necklace“. Researchers know that the Persian Gulf was one of the richest pearl sources in the old world and was the source of many hunts, where people lost their lives looking for these magnificent natural creations. In ancient Greece, pearls were a common wedding ceremony gift as it was believed that it will bring love and fortune to the newlyweds. In Rome, they were considered the ultimate symbol of prosperity and wealth. Only the highest social ranks were allowed to own them. Egypt has a deeply rooted pearl culture as well. It is a well known legend that the last Egyptian queen Cleopatra dissolved a pearl in wine and drank it so she could win a bet she made with her lover Mark Anthony. It was her way of preparing the most expensive dinner in history. Coming to the Middle Ages, Renaissance Europe had particular laws in different kingdoms, as in Rome, where only royalty was allowed to wear pearl jewelry. And in more recent history, many women celebrities, from Coco Chanel, Grace Kelly and Elizabeth Tailor loved wearing pearls. We already wrote about celebrities and how they wear pearls, so if you want to read more on world famous icons, be sure to check out our old blog posts ‘Wearing Pearls Like a Celebrity’ part one and two. A few years back Forbes reported that pearls are coming back into fashion. A modern day woman, young and old, classic or bold has to have this natural statement piece finely set on her finger. We won’t argue that classic pearl beads being a perfect simplicity stile addition to your hand or neck. Even the simplest teardrop pearl design earrings can meet the requirements of elegancy, but more so do pearl rings. It seems that fashion gurus didn’t look the right way while talking about the great pearl comeback. What is more sophisticated and bold than a simple design that can enhance your color, add a dash of class to an urban outfit or simply pop out your character in a unique design and color? Before you commit to the perfect pearl ring for women we highly recommend to think and learn about the types of pearls and their value. There are five basic colors of natural pearls. Their shine and shade depend on the metal it is embroidered with, accent details, your complexion as well as how you care for it. First, let’s go over some basic meaning of each color. This section can be extremely helpful to those people who love all the colors and love to mix and match, or are hard on making decisions! Truly a common classic found among pearls with a clear shine. It represents innocence, beauty, beginnings, eternity, faith, etc. It is a more common choice for bridal jewelry because of its pure and fruitful symbolism. As a color white represents light and is considered as a summer shade. It reflects the entire strength of the spectrum and because of that sometimes it can be hard to look at. This may be true for the cold and rigid white, while a pearl white color is often considered soft and eternal. Our Cultured Pearl Ring in Katie Heart White is a perfect representation of how something with white accents can be modern and bold, and classic at the same time. Each white pearl is differently white based on the design and details made to enhance its beauty. Lavender purple is a symbol of high elegance. It is considered feminine and romantic, and often relates to luxury and nobility. Because this color is a rarity in nature, all shades of this beautiful color reflect a unique aspect of a personality. The name of this color comes from the lavender flower. It was considered a magical plant because of its many uses in medicine, aromatherapy and health benefits. In addition, it was used for love and wealth attraction rituals, so it is no wonder it is an embodiment of romance and dreamers. The Quality Cultured Pearl Ring in Clare Lavender is an embodiment of romance. It is deeply elegant and portrays that dreamer that is hidden in you. Its light color makes it a perfect accessory for all skin tones and the ring design can be that little addition of elegance in your everyday life. Pink pearl rings for women come as the golden middle between the white and purplish tones. They are often associated with energetic people and represent good fortune and success. They are a perfect gift for young women finishing high school or entering college as they symbolize a prosperous future. This color is often portrayed as the perfect woman color. Since its name also comes from a flower, rose pink is a perfect representation of passionate women. It is a toned down warm color that is noticeable in the best possible way. It is considered a perfect white color, but as a great statement piece, it can be worn all year round. The Quality Freshwater Cultured Pearl Ring in Fiona Pink is the perfect choice for those graceful women who like to subtly reveal their bold side. Its flower crown is the perfect design that will allow your character to blossom. There is no color as profoundly deep and sensual as black. It covers all the colors and is the opposite of white. If you would take two rings, with black and white pearls, they would accentuate the perfect contrast, like Yin and Yang. The Tahitian Black pearl rings for women are made in a seashells called pinctada margaritifiera cumingi. Even though they are commonly known as ‘black pearls’ the colors range from a metallic silver, graffiti black, to dark purple and even green. A shell that carries the black pearl is extremely fragile, so the cost of making these pearls is extremely high. Black pearls make high end exclusive jewelry that a lady will wear her entire life and leave it for her descendants as a family heirloom. When it comes to black pearl rings for women, here is one of our top choices for our collection: the cultured Pearl Ring in Grace Black. A 14K White Gold ring that splits open and out to reveal a lavish bed for the Magnificent and large 8-9mm Black Tahitian Pearl, is what you are looking at here. As a color, gold is considered the most precious in the color spectrum as it represents the purest of the metals. It is a color of divine love, enlightenment and grace. This is the reason why crowns were made of gold; it reminded the people that the kings’ power came from the life force, or god in almost every religion, or civilization. Golden objects were used in religious practice around the world, such as Buda statues or even the Koran old texts. This color is perfect for pearl rings for women who are bold, powerful and self-aware. These pearls are most often used as additions to golden jewelry as pendants. They can be paired with any ring pearl color of your choice! How to choose & wear the perfect pearl ring? Color- if you read our story up to here, you are good to go. We’ve shared plenty of tips that can make your choice easier. Now that that you have already chosen your ideal pearl ring, the pearl color can be an inspiration for an eye-shadow combination, or even an entire outfit. People wear pearl rings most often on their fourth finger of their dominant hand. But that doesn’t necessarily need to be a rule. For those who believe in astrology, or like to follow Indian traditional trends, then you should wear a pearl ring strictly on the fourth finger of your right hand. 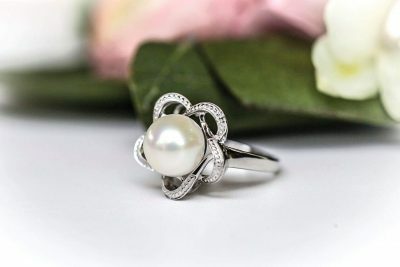 Some astrologers also advise that the ring should be set in silver, and the pearl should be mounted in an open setting so that it can touch the skin of the finger. For example, a large pearl embedded in a flower, would be perfect sitting on the middle finger. If the pearl or the design of the ring are a bold statement peace be careful with other finger you would like to pair it up with. One accent piece is just enough, don’t go overboard. All in all, you can wear a pearl ring on any finger you want. Our choices represent pearl rings for women who appreciate fine and quality details and who have a refined taste of style. They can look elegant and bold. Just be careful if you intend to wear them on your thumb as some designs are more sensitive than others. Go with a small and safely embedded pearl so it doesn’t get damaged from your jeans, pockets or buttons. Now enjoy your new asset and embrace its delicacy!